It’s time to look at RWBY’s recent manga anthology. This one got 4 volumes, one for each of team RWBY. It’s definitely nice to see more RWBY material even if so far it hasn’t taken advantage of the manga format as well as it could have. 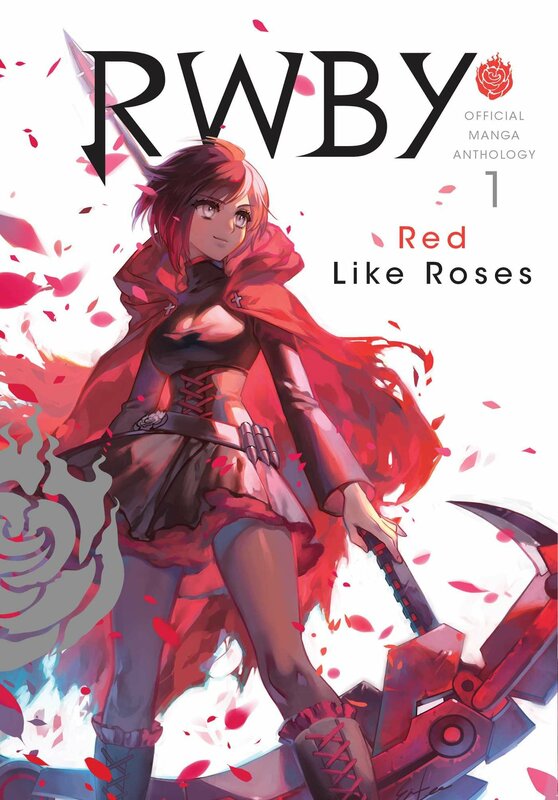 The current ongoing RWBY manga has a lot of potential, but the original one was basically an anthology as well as it retold each character short. I’m not a huge fan of anthologies and part of the issue is how not much of a story can happen in those. This one has that issue as well along with some stories having good art while some do not. Ah well, I’ll still take what I can get. Of course, I usually start off by talking about the plot, but that won’t work here. I’ll start with the artwork. As I mentioned, it really varies depending on the story. Some of them look quite good with nice character designs and details while others aren’t really all that solid. It makes for an up and down reading experience. Each volume is a good size though so there is space for quite a lot of content. On the other hand, this is still RWBY. As a result the characters can hold their own story with ease. It’s just nice to see them around in more stories. Due to the limited length per episode it’s not as if the writers can show us a whole lot of bonus material in the show. That’s sort of the point of the current RWBY manga as it will allow us to see more of the characters than the show could. For example in Yang’s volume there is a story where she beats up on a bunch of fake Neo dolls to exact her revenge. Then Neo sees this and is quite disturbed. If anything, I’d say that the series plays out like a RWBY Chibi episode. Think of all those shorts and then packing them into a manga. So there’s certainly nothing bad about the series. I definitely enjoyed reading all 4 volumes. They’re fun and make for solid reads. It’s also a decent way to get someone to check out the RWBY series if they haven’t seen the show yet. The volumes are all about character interactions after all. As each character gets her own volume they each get a lot of screen time. Yang’s definitely still the best member but each of the 4 bring something to the table. With Weiss’ glyphs she could probably give Yang a good fight if she was trying. Meanwhile Blake and Ruby are also quite skilled so it’s not like they would lose very easily. I suppose if we had gotten another volume it would have finally been time for Jaune and his team to show their stuff. They show up in these volumes of course, but it’s different being a side character versus a lead. On a side note, I definitely do like the artwork for the volume covers. They really stand out and have a lot of detail. If that’s how the art looked inside then this series would have been even better. The actual volumes are quite high quality and as I mentioned they are bigger than the average volume. As a result they feel a bit like an omnibus. It’s a style that I wouldn’t mind becoming the norm. It’s not big enough where the volume would be awkward to read, but big enough where it feels special. Overall, The RWBY Anthology is good. It’s hard to really discuss it much due to the style of the manga though. The current ongoing will likely end up being the definitive RWBY series though since it has an ongoing story. It’s a shame that the ongoing’s art is also a little below average though. Maybe RWBY characters are just really hard to draw or something. It could be a while before those stories come out in America though so now it’s back to the waiting game. I don’t know when the RWBY comics are coming out, but maybe those will be close. I’m wondering if those will also adapt the show or if they go for something totally different. I’m hoping the latter as we don’t need two adaptions. Maybe have the comic writer take their own spin on the franchise. That’d be pretty cool. This entry was posted in Manga, Manga Reviews, Reviews and tagged Anthology, Blake, Manga, Manga Review, Review, Rooster Teeth, Ruby, RWBY, Weiss, Yang by dreager1. Bookmark the permalink.